So, you want to be a DJ? Having been a DJ for nearly two decades now, I’ve picked up a thing or two. I often get asked for advice on the art of DJing (where to start, tips, tricks, etc.) so I’ve decided to lay out some of my more consistent tips and lessons for people in the beginning and intermediate stages of DJing. They may seem harsh at times, but if you don’t have a thick skin, this is the wrong industry for you. Seriously, don’t start. Not only is it an over-saturated market with people constantly getting undercut and bumped by people who, in all honesty, don’t deserve to be in the industry, but it is being flooded with people who really just don’t have the chops for it. Over the last few years it has become the hip new thing and seen as an avenue into easy fame and fortune. If you are looking for popularity, to be cool amongst your friends, get laid etc., stick to your own house parties, turn your garage into a dance floor whatever, just stay out of the professional realm. There is nothing easy about this industry if you are doing it correctly. You need to have an unhealthy obsession with music to ride it out the long run. DJing will ruin the life you have as you know it. You will lose friends, lovers, sleep, work, it will be impossible to lead any kind of ‘normal’ life. There are benefits, don’t get me wrong, but most of them result out of having the sort of obsession with music required to be a professional DJ. Two of the biggest factors that have kept me surviving and growing in this industry are that I absolutely can not live without music and I am too stupid to know when to quit. If you are still reading these tips then you either have an unhealthy obsession with music or your ego is so bloated that you think you are good enough and deserve to be a DJ. You probably think you have some new perspective or new way of doing things. Back here in reality, odds are you don’t. With any subject matter or trade it is critical to know the history. Where did it come from, who were the pioneers, what worked, what didn’t, etc. Without knowing where it started you probably aren’t going to be able to take it to any sort of new level, you’ll just be repeating what’s been done, and trust me, it has been done. Watch the documentaries, read the books and blogs, listen to the old sets and sounds, etc. Talk to and LISTEN to those that have been doing it for a long time, there is a reason they are still around, despite how much better than them you think you are. If they are working, getting paid, and making people dance, they have done something right to get there. Respect is often a missing component in the industry these days, but absolutely critical for the industry to survive and thrive. Don’t kill the industry with your lack of respect and ego. Study, learn, respect. Practice all the time. This is a skill, and though you either have the foundation skill or you don’t, you still need to develop and improve that skill by actually doing it. A good starting point is to start with two copies of the same song and mix it every possible way you can think of. It doesn’t matter what song, just something you really love and know, so you can hear clearly when the mix is on and when it is off. Record everything you do and listen to it. You need to develop your ear, not just for beat-matching, but for programing, song keys (just because you can match two beats doesn’t mean the keys the songs are in go together). Technology has changed a lot of things, we can mash up songs that could never have gone together before, but again, just because you can do a thing, doesn’t mean you should do a thing. Develop your ear; listen, record, and repeat until you don’t feel you are making progress, then start asking for feedback. Don’t make everyone listen to everything you do, especially in the beginning. For one, it’s annoying, your mom may like to put your scribbles on the fridge but others don’t. Secondly you will want to avoid having people’s first impression of your work be poor intro level stuff. It will stick with them longer than you would expect. There are a lot of ways to DJ now. Learn as many as you can. Seriously. The technology will only continue to change, what is standard at an event now will not be later. Not to mention that different venues have different gear and different sound systems. Ask around, everyone is a DJ now anyway so it won’t be hard to find different gear to practice on, and who knows, maybe they are good enough to show you the proper way to use it. Learn vinyl, not just Traktor or Serato, but vinyl. You may be naive enough to think it is an out-dated and dead format, but there are valuable lessons to be learned by using it. There are elements and lessons you can learn by using that vinyl that can never be replaced. 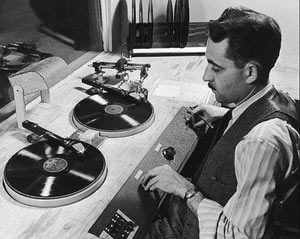 Vinyl has a certain soul and history that you have to take part in if you really want to be serious in this industry. All the new tech is trying to maintain the principle and feel of vinyl while offering new tools that vinyl doesn’t provide. Think there might be a reason for that? Plus, honestly, it just takes more skill to DJ vinyl, all you have is you and the music, no bpm counter, no key meter, just you and your (hopefully existent) skill. In fact, vinyl can be a good judge of whether or not you should even be a DJ. If you can’t DJ on your own, why should you be considered one? If the technology is doing all the work for you, your computer is a DJ, you are not. When you buy your own gear don’t skimp, you will only be sorry when you replace it for better gear. This isn’t a cheap industry to get into (cheaper now than it was, granted), but you want stuff that will last and when you do eventually play out at a decent venue, you will know how to use the gear and not get nervous because it is way more advanced than you are used to. If you want to get anywhere in this industry you need to be making music. I’m not talking about cutting and rearranging someone else’s music and calling it an ‘edit’ or trying to pass it off as a ‘remix.’ And I’m not just talking about making some mediocre stuff and putting it out on your friend’s label or even worse starting your own label because no one is picking up your music. I’m talking about making good music, music that other people buy and play. If you don’t have the music making talent, you can still DJ, but don’t expect to make it to the top. To learn my tips on producing, refer to the above tips, same principle. These are by no means all my tips, but if you want more you will probably have to prove to me that you are not just another douche bag trying to be cool and looking for an easy fix. This entry was posted in DJ Tips, General Nonsense, Humor, Music, Philosophy, Rant and tagged dj, DJ equipment lessons, DJ fail, DJ school, DJ tips, hip hop, house, how to be a DJ, learn to DJ, not your jukebox, sean ray, spin by Sean Ray. Bookmark the permalink. 6. Enjoy yourself when you play and look like it. You would be surprised at how many people don’t, and the crowd always gets it. Big follower with this page, plenty of your blogposts have definitely helped me out. Looking towards updates!